Invitation pockets are very popular because they neatly and stylishly present all of the cards that go into an invitation ensemble – invitation card, reception, direction, RSVP, etc. To properly design your invitations, it’s essential to know the dimensions of the panels and the construction of the pockets. Understanding these specification will insure your cards fit nicely, the pockets fold smoothly & everything fits comfortably inside the mailing envelope. 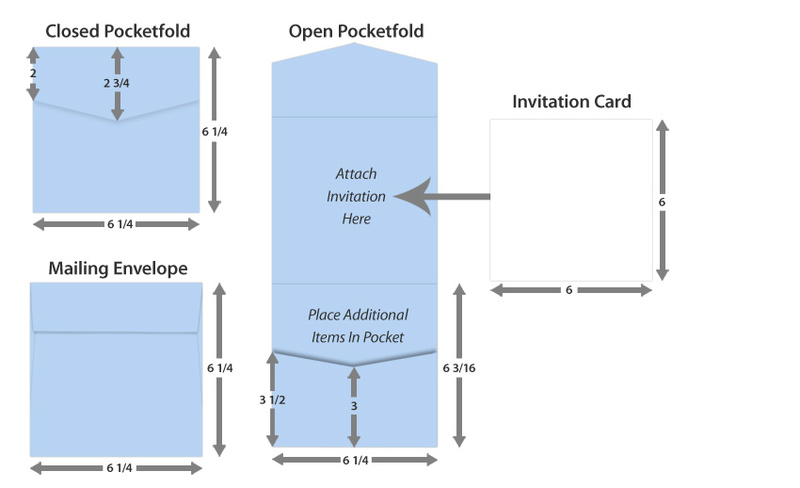 We have clearly outlined the different LCI Pocket Invitations with their respective opened & closed specifications. 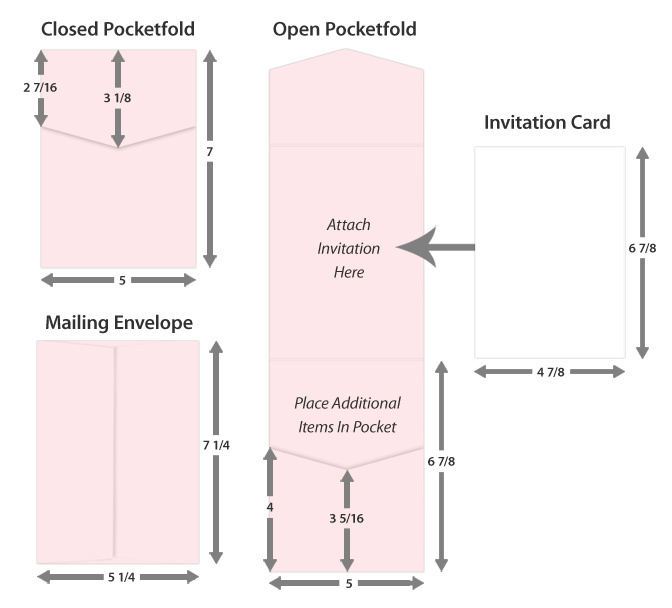 Invitation Pockets in 5 Styles. Which One is Right for You? Size keys are below so you can shop for properly sized cards and envelopes for whichever pocket you choose. Need a card size that isn’t offered on our site? If you need a custom card size for your pocket that is not offered on our site, let us know! We offer custom cut cards and would be happy to get you the cards you need! My invitation cards are size 5×7 and come with 5.25×7.25 envelopes. The invitation is printed landscape. What size pocketfold would I need to order to fit a 5×7 card? It looks like most of these specify that the card must be trimmed down from 5×7 in order to fit the pocketfold. I was planning on mounting the 5×7 card onto one side and in the pocket I would keep the rsvp card and enclosure card. Please let me know which size you think would fit best–thank you! As you discovered our pockets are designed to handle invitation cards slightly smaller than 5 x 7. 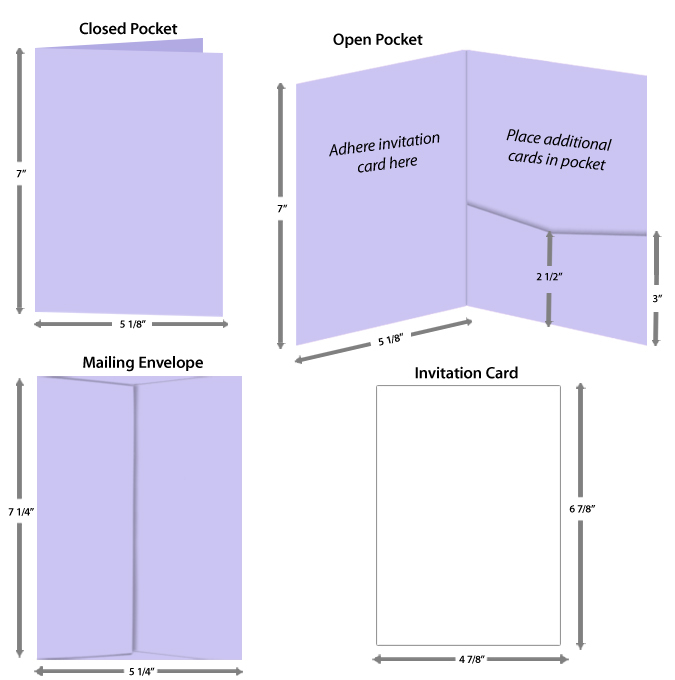 In order to get the 5 x 7 invitation size to fit you would need to find a pocket invitation that is at least 5 1/8 x 7 1/8 and probably closer to 5 1/4 x 7 1/4. 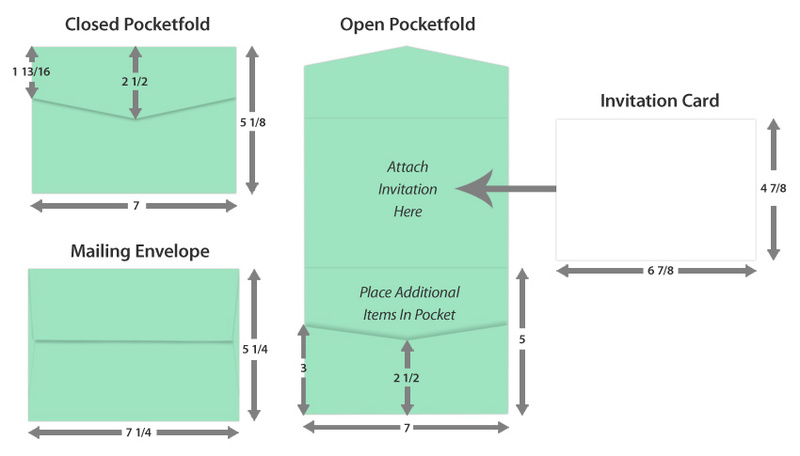 However once you get to that size, the invitation envelopes you purchased will no longer work. When we design our pockets we size them to fit standard envelope sizes. If we did not it would be almost impossible to get envelopes to work with the pockets. It is far easier to design invitation cards to different sizes than it is to custom make an envelope. Do any of these styles cost more to mail than others? In most cases, pocket invitations are over one ounce, as they are made of several layers of thick, heavy stock, and enclose several heavy cards as well. However, based on shape, and not weight, rectangular mailing (A7 pockets) do not require additional postage, but square mailing ( 6 1/4 square pockets) do require an additional surcharge.